I just purchased the Halloween Treat Offer and email doesn’t show my coupon code. It just says "Coupon code: " and doesn’t have a code. Please send me my code. I just bought the https://www.joomlart.com/joomlart/halloween-2017 , my account joomlart is fine that why i can write here. but how can I access to Gavick, I already create account and it’s working, but how can i get my treat now 1 year? and jomsocial 100$? can you please tell me how to get access to Gavick and 100$ OFF Jomsocial. the same here. no coupon and no access gavick……I sent an email but hear nothing ……………….. I got an email and everything is fine. I got My Halloween Treat as promotion!!! 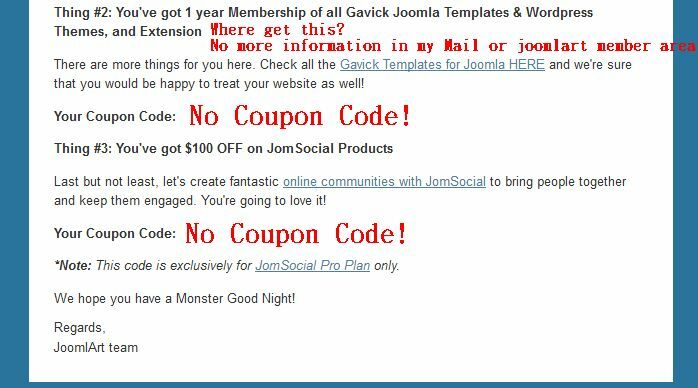 Hi I got the email with coupons for gavick and jomsocial. I got my Halloween Treat. We had an issue with few emails sent out yesterday as they didn’t include the coupons inside. We already fixed this and manual emails have been sent to the users with missing coupons. Please check your inbox and open the latest email from us. 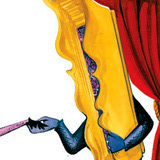 The email titled "Ding Dong! Your Halloween treats have arrived!" was sent to you on 26th Oct. Please help to hec again. I actually just resent the email to you too just in case. I purchased your Halloween Treat Package, my account joomlart is fine but i can’t connect to Gavick Templates for Joomla. Can you please tell me how to get access to Gavick ? I checked and the coupons has been delivered to you via email on Oct 23. Our email sent to you was titled "Your UnBOOlievable Codes for Halloween Treat Package!". Anyway I’ve just forwarded you this email again, please check your email inbox now.